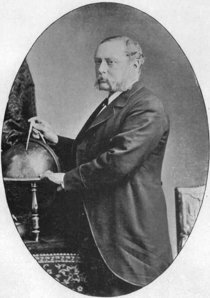 Richard Proctor was an English astronomer, educated at Cambridge, who first suggested (1873) that meteor impacts caused lunar craters, rather than volcanic action. He studied the motion of stars, their distribution, and their relation to the nebulae, produced one of the earliest maps of Mars, and took part in expeditions of 1874 and 1882 to observe the transit of Venus. Each planet, according to its dimensions, has a certain length of planetary life, the youth and age of which including the following eras: – a Sun-like state; a state like that of Jupiter of Saturn, when much heat but little light is evolved; a condition like that of our earth; and lastly, the stage through which our moon is passing, which may be regarded as planetary decrepitude. Have we then been led to the Whewellite theory that our earth is the sole abode of life? Far from it. For not only have we adopted a method of reasoning which teaches us to regard every planet in existence, every moon, every sun, every orb in fact in space, as having its period as the abode of life, but the very argument from probability which leads us to regard any given sun as not the centre of a scheme in which at this moment there is life, forces upon us the conclusion that among the millions on millions ... of suns which people space, millions have orbs circling round then which are at this present time the abode of living creatures. Despite his tendency toward metaphysical speculation, Proctor played an important role, as Whewell had done and as Flammarion was doing in France, in shifting the extraterrestrial life debate onto a more scientific footing.